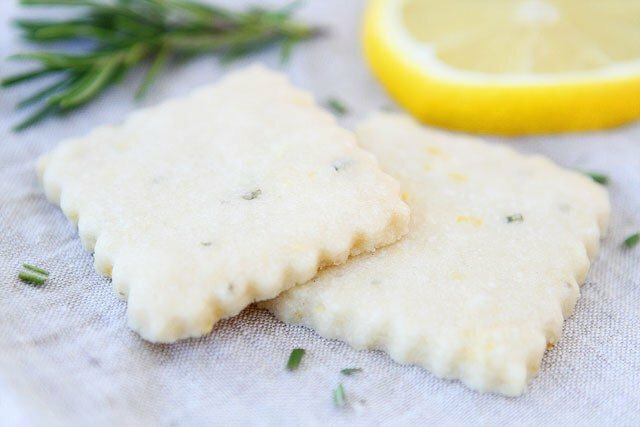 Lemon Rosemary Shortbread Cookies-crisp, buttery cookies that are perfect for tea time or any time! Last summer Josh built a raised herb garden in our backyard. We planted a variety of herbs and flowers. The beds were covered with snow for most of the winter. Our snow finally melted so I went outside to get some fresh air. I noticed that our rosemary was still alive and going strong. I guess it didn’t mind the snow! I snipped a few rosemary sprigs and went inside to tell Josh about our brave little plant. I love shortbread cookies because they are super easy to make and because of the obvious…LOTS of butter! The cookies are crisp, buttery, and slightly sweet. 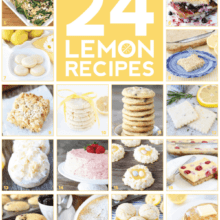 The lemon and rosemary add a nice twist to the classic shortbread cookie. I love biting into a cookie and getting a hint of citrus with the savory rosemary! A match made in heaven! The shortbread cookies may look plain and simple, but they are full of flavor! 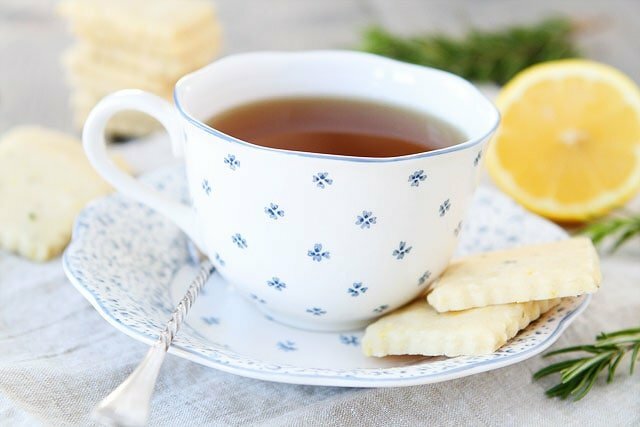 I pretended I was living in the olden days and made a cup of hot tea to enjoy with my Lemon Rosemary Shortbread. I didn’t put on a frilly dress and white gloves, but I still felt special as I sipped my tea and nibbled on my perfect little cookies. It was the perfect afternoon snack. 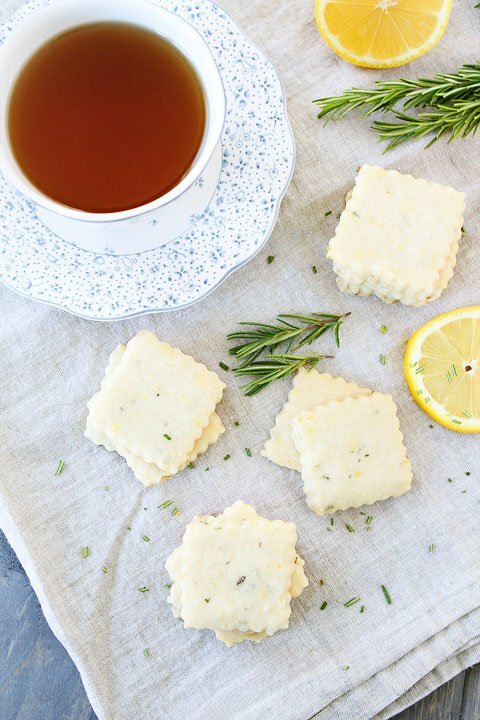 Lemon Rosemary Shortbread cookies are good for tea time or any time! Make a batch today! These cookies are delightful and will brighten your day! 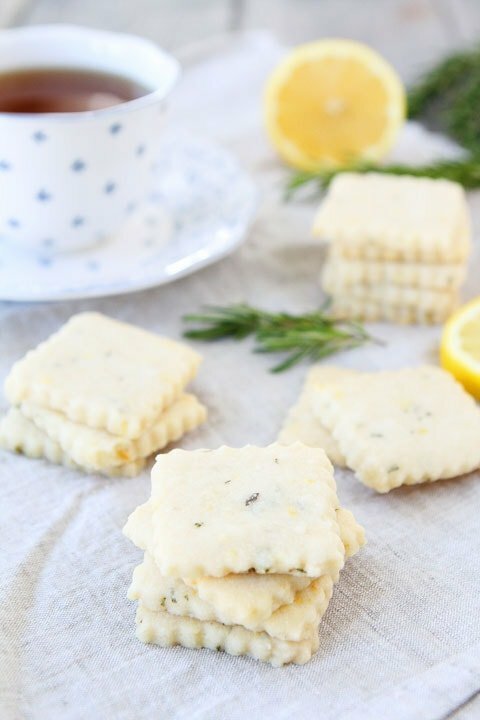 Lemon Rosemary Shortbread Cookies are the perfect cookie for afternoon tea or any time! We love these crisp and buttery cookies! In a small bowl, whisk the flour, salt, lemon zest, and rosemary. Set aside. In the bowl of a stand mixer, beat the butter and powdered sugar until smooth and creamy, about 3 minutes. Beat in the vanilla extract and lemon juice. Slowly add in the flour mixture and mix until just combined. Form the dough into a disk shape and wrap in plastic wrap. Chill the dough for at least 1 hour or until firm. When ready to bake, preheat oven to 325 degrees F. Line a large baking sheet with parchment paper or a Silpat and set aside. On a lightly floured surface, roll out the dough into a 1/4 inch thick square. Cut into squares, rounds, or shape of your choice using a lightly floured cookie cutter. Place shortbread cookies on the prepared baking sheet and bake for 10-12 minutes, or until cookies are very lightly browned around the edges. Remove cookies from baking sheet and cool completely on a wire rack. Note-Shortbread cookies with keep in an airtight container for about a week or they can be frozen. Shortbread is my favorite because ALL THE BUTTER! And, I am in the mood to eat cookies…always. These are a definite happening! Love the simplicity of the lemon and rosemary! How cute are you! These cookies look so cute and delicious. 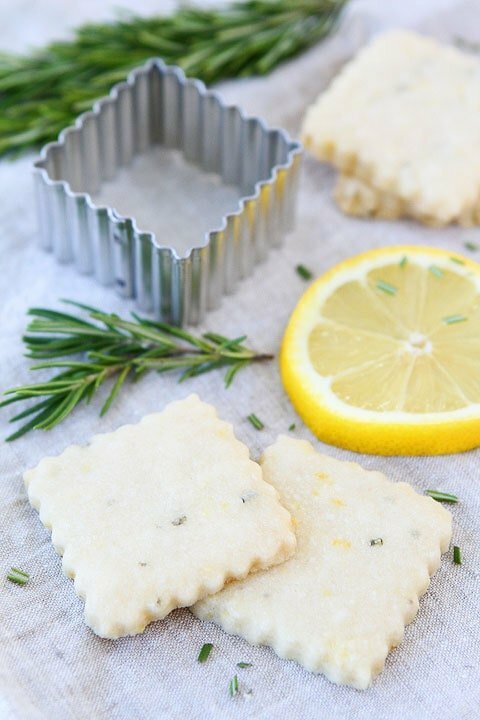 I love the addition of rosemary in your lemon shortbread cookies. I’ve done a lemon + thyme combination, and that’s lovely as well. I can’t wait to try these! Oh yum! Did you watch downtown abbey with your tea And cookies? Citrus and rosemary is one of my favourite combinations. Sweet, but not too sweet. Scented, but not overpowering. These look stunning – and I can’t wait to bake a batch! PS I love the square shape with the pretty trimmed edge – such a gorgeous detail. 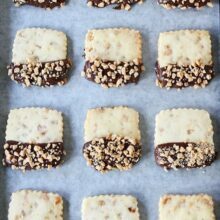 Haha my tea time would turn into an all out binge session with these shortbread cookies! They look too amazing to have just a couple!! These are just So pretty Maria- love the unexpected rosemary addition! Beautiful fresh cookies that reminds me spring should hurry and come! Clearly, I am missing out because I have never made a shortbread cookie!! GASP! Can’t wait to try this recipe! I love citrus shortbread cookies! The addition of rosemary makes them even more fabulous! These make me long for summer, it’ll be months before I have it growing in my garden! 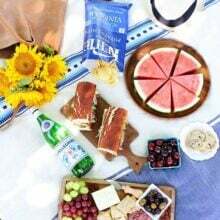 But I just pinned this for later (and to share with my readers), I can see Cowgirl G and I enjoying a picnic style tea party out on the prairie this summer! I wish I had these to snack on this afternoon! So delicious!! So pretty, love the mix of lemon and rosemary! I can practically smell these cookies just from your photos! What a refreshing flavor combination! I could use a few cookies and a spot of tea! We had a huge Rosemary bush that lasted years at our house until one really extremely cold winter and it never returned! We tried planting a new bush 2 years ago but my lemon balm seemed to over whelm it! Hopefully I can find a better location this year! Pinning for later in hopes we have a new rosemary bush! These look delicious (and fancy)! Love the idea of a savory/sweet combo! By the way, where did you find your cookie cutter and do you happen to know what brand and size is it? I’d love to replicate these and maybe even try a lavender shortbread, as well. Yum. Yum. These look perfectly lovely….perfect for tea. Can’t wait to try them. I made these yesterday, and they are delicious. My rosemary is staying in our kitchen for the winter and is growing strong. I had a cup of tea with mine, of course, as they just go together so well. Thank you for sharing the recipe! I made these last night and today had an authentic McCloud Scotsman pronounce them Perfect! They may show up at the McCloud reunion this year after he visits this site for the recipe! This sounds yummy, but is the flour sifted or unsifted? if unsifted, what is the weight per cup? Thank you! 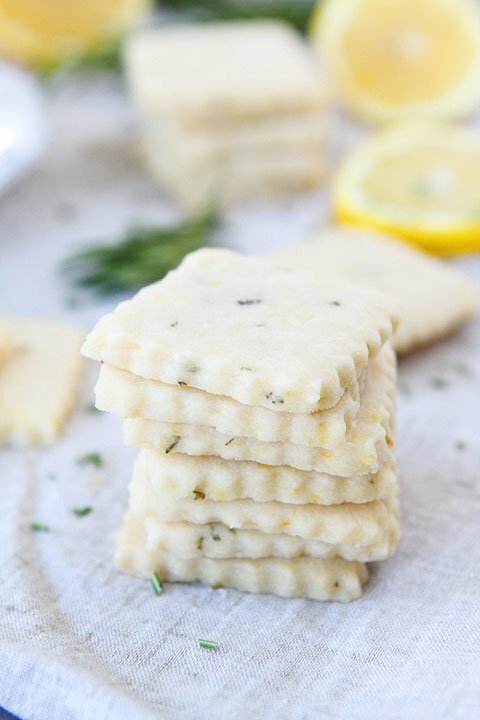 SUCH a small world — I posted lemon-rosemary shortbread cookies last week without even seeing your version… there’s just something about fresh citrus and herbs that screams spring and I had been craving it so much! These are wonderful cookies that are making many people happy for Christmas this year! Thanks for sharing this simple, delicious recipe! Delicious! I rolled these in a log shape instead of a disc and once it hardened, I cut into 1/4 inch circles. Wonderful flavor! 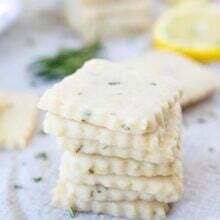 Thanks a lot for this recipe, I had made shortbread cookies with lemon and sesame seeds; but never imagined I could bake with a fresh herb. I tried it out for an event (I used orange instead of lemon and the fresh rosemary) and people loved it. Thanks for sharing. I just baked this recipe today. I made them to your instructions but can not taste the rosemary in the cookies. I know it should be subtle but I can not taste the rosemary at all. Maybe I’ll just add more on my next try. Thank you. I can’t wait to try these! Can you PLEASE tell me where you got that square, fluted cookie cutter? I have been looking for one for, literally, about ten years!! Thank you! At a store in Utah called Spoons ‘n Spice! I have wanted to try this recipe for a couple of months now. Today, the house was empty, chores done, so I did. These are fabulous little shortbreads! Thank you for sharing this recipe! 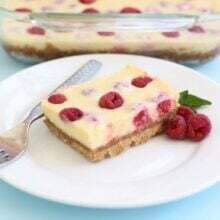 I buy these at sister pie bakery in detroit (rosemary & salt, no lemon) they have super creative baked goods anyway these run .50 each I’m addicted~ your photo’s are the exact same color & thickness as the ones they sell. 1) I noticed this is 1 butter to 2 flour~ a shortbread recipe handed down to me was 1 to 1; do these still have a good buttery taste?~ maybe it needs to be 1 to 2 because of being cut (the other recipe is in a pan) thoughts? 2) I see someone said not much rosemary flavor, I love rosemary, I don’t want it to overwhelm but I love the lingering after taste ~ thoughts on if the quanity should be increased. Hi i made this and it’s amazing. I created my own blog post with a link to your page. I’ve made these, they’re delicious. These are truly awesome! The rosemary seems to cut the sweetness of the cookie so it’s not too cloying. I made these for my cookie exchange, where I’m sure they’ll be a hit. They certainly were with my family! Yay! Happy you liked the cookies! I’ve made these for 4 years now. It is one of the best recipes I make for the holidays. People request these cookies all the time. A few things I’ve learned over the years. Refrigerate the dough overnight. It makes life so much easier. I personally roll these out thin. I make the cookies about the shape and thickness of a Kennedy half dollar. Aside from that, I follow the recipe exactly and it is one of my favorites. I made your recipe and it’s delicious! The gals at book club were all impressed. I’ll be impressing more guests with this one. Thank you kindly for sharing the recipe. Since 2014 – I have used y’all’s recipe. My grandsons, Alfred IV (Tótó ) & Vincito have enjoyed helping me bake your recipe for last 4 years. So simple and delicate, these cookies have their mom’s (my daughter’s) approval as an “after-school” or “summer- vacation” snack. Thank you. If you don’t mind … I’m going to try using basil next time, instead of the rosemary. I hope they turn out as delicious as y’all’s original shortbread recipe.